Personally, I don’t believe that it’s fun trying out a ton of things and ordering and returning over and over. At least it isn’t for me. I think it’s called hell and frustration. Yes, I’m all for pushing the design envelop, realizing that you’re taking chances that could fall flat! But proceeding without a plan and leaving it all to chance and frustration … nope, not for me (and not for my Handsome Husband either, who has enough frustration at work without seeing me spend money over and over again without progress on the house). Don’t you sometimes wish that, once and for all, you could know if your design plans were going to work? I’ve never really talked about my Design Master Plan services, aka “E-Design,” on the blog before, but I’ve had more than the usual inquiries recently, so I thought it might be time to discuss it. People tend to think of E-Design as an online-only enterprise, and for the most part that’s true. Master Plans are great for distance clients who want Home Glow’s touch. They are also great for clients who need to decorate a space over time or who want to be hands-on. And while Master Plan clients don’t get to take advantage of my full-service product pricing or super customized options, they can wait for sales on a number of things from online or local retailers. Most of my local clients tend toward full-service design because of the customization and money savings. However, every now and then I get a local who needs to decorate her space over time but wants a road map so that she doesn’t make any mistakes. As such, I recently completed a Design Master Plan for a local client’s living and dining rooms, and I really think it came out beautifully! For a little info about the process & pricing for Home Glow’s Design Master Plans, see the Interiors link on Home Glow’s services page. My client is extremely detailed and thorough in her professional life, and she wasn’t afraid of hard work and sweat equity, but she knew her strengths and weaknesses. Pulling together a decorative scheme — no. Enacting a detailed plan crafted according to her own personal style — yes!! 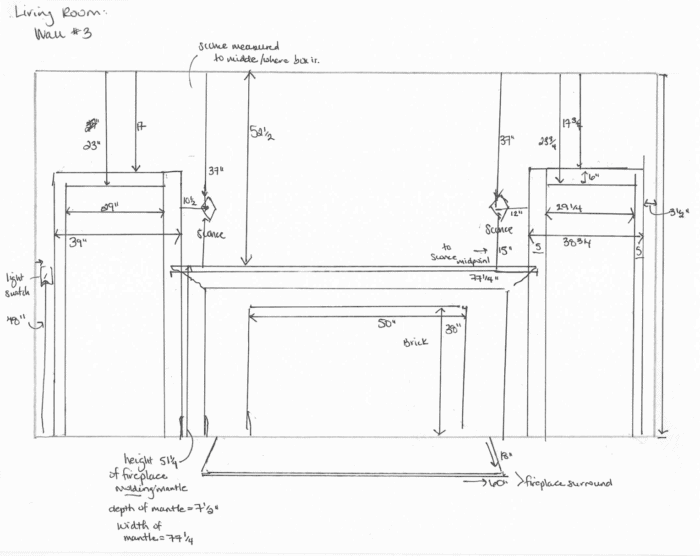 First off, my client did an AMAZING job measuring and photographing to Home Glow’s instructions. Look at these examples! Her answers to the Questionnaire were also very thoughtful, and her inspiration images all had descriptions about what she liked and why. Perfection!!! My client is at a place in her life where she’s done with throw-away decor and furniture. She wanted things to be nicer with quality that will last, knowing she would spend more on upholstery and less on accent pieces to balance her budget. Her job is very fast-paced, so she wanted to feel peaceful at home, but also gravitated toward dark saturated colors. She liked more tailored pieces and clean lines, but didn’t want her bungalow to feel modern, either. Her living room floor plan, in particular, was causing her pain because it had 2 windows, 6 doors/doorways, and a fireplace. Where should furniture go? Lastly, she had just purchased a dining table and chairs from Pottery Barn, so those had to be a part of the plan. She had a dark grey sofa from Pottery Barn as well. I was honest with her in that I felt it was a little too big for the space, and that a smaller, lighter color sofa would make better use of her square footage. So, while she wanted a plan that could use her sofa, she also was interested in custom upholstery options. In the plans below, I show the sofa option I thought was best, but her current sofa could be interchanged — all the items work with it. First up, the mood boards I created for her. I kept the envelope serene — using a slightly purple gray on the walls and allowing the sofa and rug to blend. The pattern on the chairs is a white on a similarly pale gray, just enough pattern to differentiate without disrupting the eye. The focal point is now the fireplace. The fireplace was a huge question for my client. She was planning on putting in a wood burning insert, but what should she do with the red brick? My client’s absolute favorite part of above living room scheme was my idea to paint her fireplace mantle a beautiful deep blue and the bricks dark charcoal — a color to be repeated in the French doors on either side of the fireplace. The two rooms are defined spaces but have a flow. We unified them through color scheme, but mixed up where that color would hit your eye. 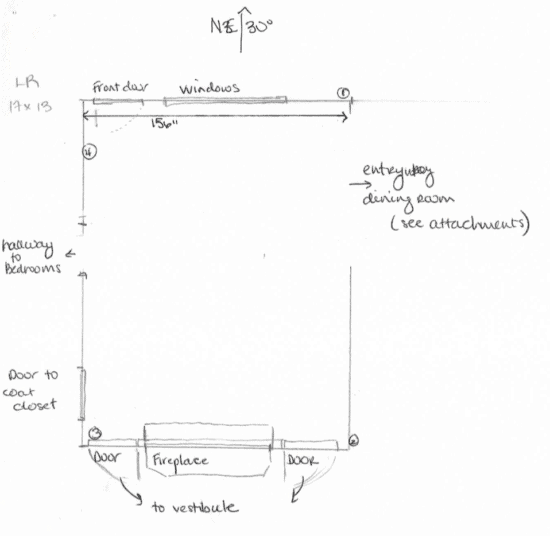 While my client originally thought her sofa should go along the one longer wall in her living room, I came up with a different solution for the floor plan. I created a faux “entry” by facing the apartment-sized sofa toward the fireplace and backing it with a console table with shelves for books and family pictures. A runner rug now defines that space and leads a visitor into the dining room. Side note: in general, people totally under-light their rooms!!!! There should be multiple layers of light in every space. Luckily, my client already had old wiring for sconces, but there still wasn’t enough light, and there wasn’t any room for side tables with lamps. Having that console table with 2 lamps behind the sofa was crucial to giving the space enough light without having a very costly renovation to provide overhead lighting. While 3D images are not usually a part of Design Master Plans (unless the client wishes to pay extra for them 🙂 ), I threw this plan into 3D for the sake of today’s post. Yes, the above image is “to scale,” and I can add some exact items from the plan, but by and large, my 3D skills are representational only. The above shows scale and how color and pattern play across a space. The URL source list I provided my client had links to everything in the plan, including all fabric choices for window treatments and upholstery. Offering custom upholstery as a part of Design Master Plans is something I’m considering if there is enough interest. 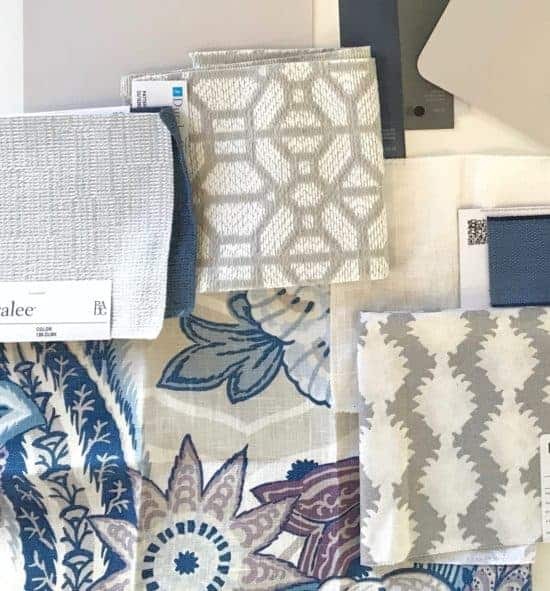 Because this client was interested, I specified a sofa in a pale grey Crypton fabric with a contrast denim trim and lounge chairs in a patterned Crypton fabric from one of my trade vendors. You can’t get that stuff from Big Box. The most fun thing about doing this Design Master Plan for a local client (as opposed to a distance one) was being able to present the plan in person and see her reaction … which was a little emotional … for both of us! I get so fired up by creating a real sense of “home” for people! And I LOVE helping home decorators have the confidence to enact a plan over time, knowing the goal is in sight. So tell me, do you feel overwhelmed by pulling together a space and want help but don’t have the budget to throw at it all at once? Is custom upholstery an intriguing option, or something you wouldn’t care about? Next week, I’ll be back with an interview with an AMAZING artist. See you Saturday!